Here are the Run Commands for Windows Operating System listed in Alphabetic Order. Remaining commands on next post. Drop a comment below to reach me or provide feedback on above post. Today, I am going to share rest of the Code for Listing Database, Tables Inside Database and Columns and apply them with Operator and simply perform Select Operation from database and list the Result in DataGrid. Let's look the Design you have previously saw when making connection. In Database Combo, we will list all database from Connected Server. Then in Table Combo, we will list all Tables of Selected Database and in Column Combo all columns of Selected Table. Lets Begin the Code. On Button Click and Successful Connection, we will load all database names in Database Combo. Actually we have did it earlier. This is code from earlier post. Now Lets see the Code on SelectedIndex Change event of Database Combo (Combobox2). Now above code will make all Columns of Selected table from database. Now Directly move to Keyword TextBox textchange event which will load data as you type. This will load data in GridView automatically. Lets see a snapshot once again with Result. Hope you all are enjoying. Friends I am back with a new thing for you. Today I am going to show you, how to make a Good Accordion Panel. Do you know, what is Accordion Panel? You must have seen some tables or Div's in website, that are collapsing and expanding on just Click. You can also call them Collapsible Div or Table. ASP.NET Ajax Tools make it so Simpler for ASP.NET. You just need to link AjaxControlToolkit.dll to your bin folder and use it in the Page. Let's add a new Web Form in Solution, this is the Page, where you want to add your collapsible div or table what may contain anything. Source Code for Design above is here. 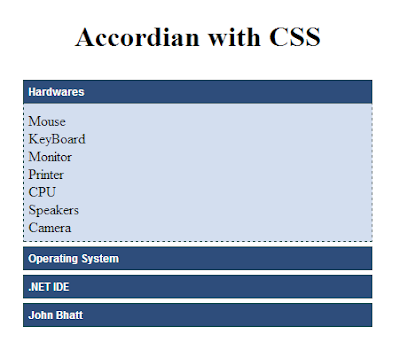 Now Let's See the CSS, what is on CSS. Now Run the Page again. Lets See, how it looked. Check this at your machine. Best of Luck! We are going to learn how to upload a File using FileUpload Control in ASP.NET. ASPX Code. We Placed a FileUpload Control and a button to Click. Now BtnUpload_Click event in .cs page. We are going to Upload only Picture (.JPG file or .BMP file). A method to Pass Time and in its language utility to connect with World. There are more accounts on Facebook than the Polulation of Earth. Friends, some one is willing to do good work using Facebook. You should support. Just one click to Support a will to do for the Nation. I think every body wants to do something for his nation. Its time to do something. Lets Vote for Help Nepal Network on Chase Community Giving's Polling Competition. As we know, DataList is the most versatile Data Bound Control available in ASP.NET. Where you can display data as per your need in your required style, direction etc. But there is some problem also. There is no option to Paginate the Data Loaded in DataList directly. In case we have too many records, we can not display all them in One Page without paginating. To escape from this situation, Developers move to GridView, which has easy support for Paginating data. Today, we will learn How to Paginate DataList data in Simple steps. First create a DataList as per your requirement. I made like below which is quite simple. &LT;asp:DataList ID="DataList1" runat="server" Height="194px" Width="174px"
We created a new object of PagedDataSource. Paged data source as name stands clear, paginated data. 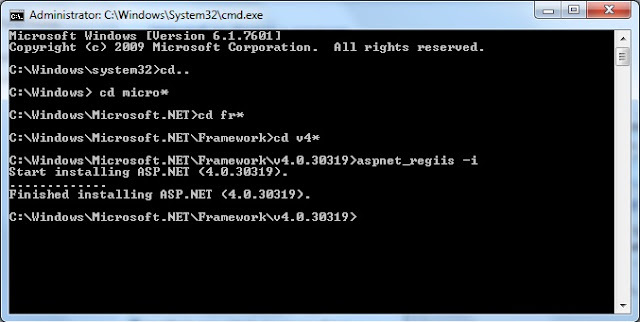 Now we wrote Query, Passed in Adapter, Filled DataSet which should be all clear, because it was Basic Task in ADO.NET. Now we gave it CurrentPageIndex. means where is page now. For this, just look below to a class CurrentPageIndex which is returning value of CurentPageIndex =0 if page is beling Loaded. To check whether page is loaded or postback, we take help of ViewState. If ViewState["pg"] == null, On Page load this will be null because it is just being initiated. On Postback it will pass the Int value stored in it to CurrentPageIndex. We set Pagination in PagedDataSource true and Define Page size of 5 records per page. Now Passed PagedDataSource object as Datasource of Datalist. Now Linkbutton click events, We increased and Decreased value of CurrentPageIndex. Hope this must be helpful to you. In case of Any problem, correction in code and help, feel free to comment below. While Answering a question at Forum, I wrote this post. Suppose We have Multiple Textbox in Same Page and we want to Implement AutoSuggest/AutoComplete feature in All Textbox and of same type. Suppose Multiple Google Search Boxes. For that case, we have separate Textboxs, Separate AutoComplete Extenders and Separate Methods. We are trying to Consume same PageMethod in All Textbox. Lets Look at the Output. 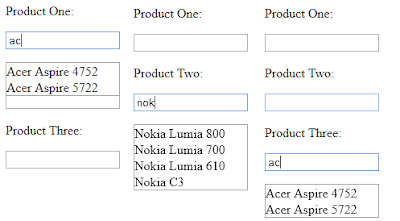 How to Make a Complete Dropdown and Prevent Inserting Dummy Data from Form. I am talking about Release Date of Upcoming Version of Windows. Worlds Most popular Operating System is now back with a Bang and Performance, Feature, Speed and Security Rich (Richer than MS), Windows 8. 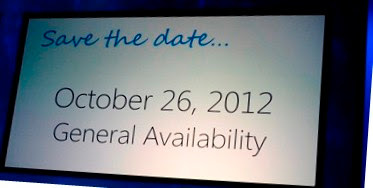 And Now the Official announcement of Release Date of Windows 8. I am going to write a blog about me, It's neither about Tech nor any other Courses. Its personal. On the 13th of July 2008, I left my family to work. I've just gave Exams of +2 and worried about Exams. So I decided to go to India and do some job between the time period of Exams and Results. I have done a Basic Computer Course called SOP (Smart Office Professional) from UNIT-IT, then I did a crash course from Modern Computer Institute which took about 2 months. I, a friend from Village Jagdish and my and Brother (in family relations) left home at the afternoon of 13th July which I still remember. Next Day morning , 14th July 2008, I was working with a Transportation Company named BEST ROADWAYS LIMITED. 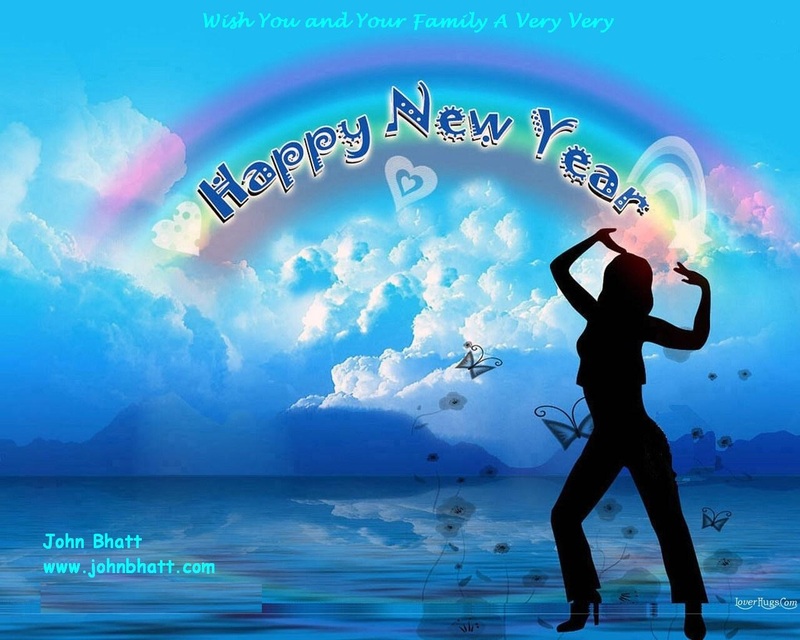 I was First time in India for permanent living and directly in Haryana. The Language of Haryana is some hard to hear and direct hits ear (but they are really nice). Slowly slowly I adjusted myself with atmosphere. Now Summary of things what I think I got after leaving home. Experience of Work / Job. Deep Introduction of Human Nature at Job. My biggest earning which I think is faith and believe of some people which can never be bought. I can not describe the Joy of listening these Words. 'परदेश में होकर भी अपने परिवार से ज्यादा प्यार करने वाले परिवार पाने वाले तुम्हे देखकर मुझे जलन होती है | '. Just Got the 10,000th Visitor to make my blog hits.. I am once back with a blog/article/tutorial whatever you think/call it. HTTP Protocol is State less protocol. In Simple Language, Each and Every time We send a request to server, this is New to server. Now, the task is To Enter Number in Textbox and Click in First Button to Convert to Integer format and then Click Second button to Print Square of Converted Integer in Textbox. What will you do. Lets look at code what I did here. Now what would I get Result on Second Button Click event. Textbox Result will be 0 even I have entered any number. Don't agree, try this at home. This is Because, at the time of Button2 Click new request is send to server and Initial Value of X is picked from server which is 0. 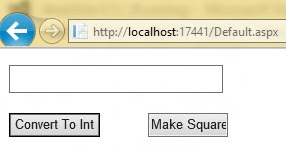 To Prevent the Loose of Data each time we send request to server, ASP.NET have implemented concept of State Management. State Management is divided into 2 parts according to Functionality. I am going to Describe all these States step by step in Different Posts. All the Series has been posted on DotNetSpider at below Link Resources > Keep Reading. We will learn how to enable AutoCompleteExtender in Textbox Control. Here, We will learn to Map data from SQL Database to Textbox within Same Page. WebMethod in .cs Page. Add these Namespages for below Code. using System.Configuration; // Access Consting from Web.Config. I have Selected Only Unique Value from Database using SELECT DISTINCT .... command. 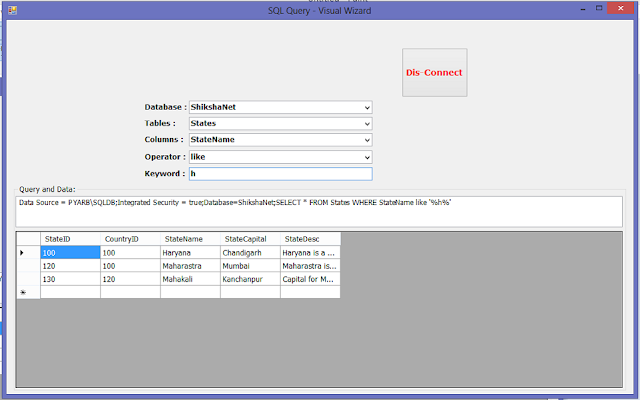 If you want all records, Simply Change SQL Query to SELECT ..... Will be glad to hear from you... This Post is copied from DotNetFunda where I wrote in Code section. Lets Look at the Code. We are using ASP.NET Ajax AutoCompleteExtender for more enhancement in Code (This will only work in ASP.NET). If you are using Plain HTML, Just use this code. Now code for C# page if you are using AutoComplete Extender. We are going to learn how to Export GridView data to Microsoft Excel at Runtime. // Can Leave This Blank. Some Basic and Important Shortcuts. Tab or  Key (Right Arrow) Move One Cell Right. Shift + Tab or  (Left Arrow) Move One Cell Left. Enter or  Key (Down Arrow) Move One Cell down. Shift + Enter or  (Up Arrow) Move one Cell up. Page Up One Screen Up. Page Down One Screen Down. How to Close Microsoft Excel 2003. Click on Lower Close button located below the Title Bar’s Close button. Doing this will prompt you top save document if it is not saved yet. Then Click on Close Button of Title Bar. 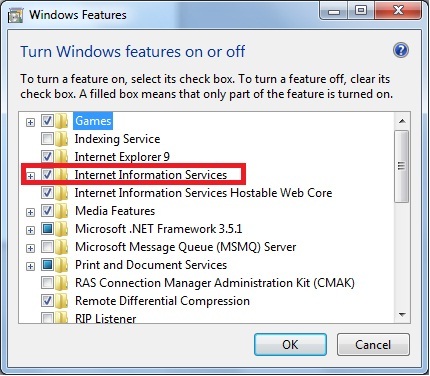 Right Click on File Name in Task Bar and choose Close option. Microsoft Excel will prompt you to save document if it is unsaved. Click on ALT+F4 key directly from Keyboard. Microsoft Excel will prompt you to save document if it is unsaved.